Mornings never seem to give you enough time to get everything done before leaving for work. There’s making and eating breakfast for yourself and others, catching up on the news, showering, choosing an outfit, putting on makeup, and getting the kids off to school. The luxury of squeezing in a morning workout is a pipe dream for most working professionals. Streamlining your busy routine in a few imaginative ways can help save you a little time every morning. Your bedroom closet is a great place to start in order to make some improvements. As you can see, messy closets are a particularly notorious culprit for wasting time. Let’s look at nine clever closet accessory organizer ideas to improve your bedroom closet’s functionality, which can help you reclaim some of that precious time that’s being wasted. 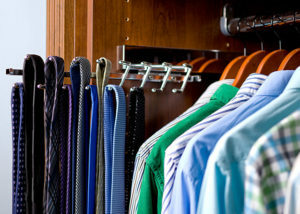 A pullout tie rack is perfect for any man with a large tie collection who just can’t seem to keep them all organized. More than one tie rack can be added to a closet if a tie collection is particularly large. This space-saving tie rack smoothly pulls out to allow you to see everything in your tie collection at once. That makes it easier to pick a tie that goes best with the suit you’ve chosen to wear that day. Another benefit of a tie rack is that it gives all your ties a proper home. They won’t end up folded up on a shelf or drawer where they can get wrinkled. If you’re a collector and connoisseur of luxury watches, your expensive collection is sure to include a few automatic watches (also known as self-winding or mechanical watches). Unless automatic watches are worn regularly, their self-winding process won’t activate. A watch winder is needed to keep the timepieces always running, thereby keeping their time and date accurate. 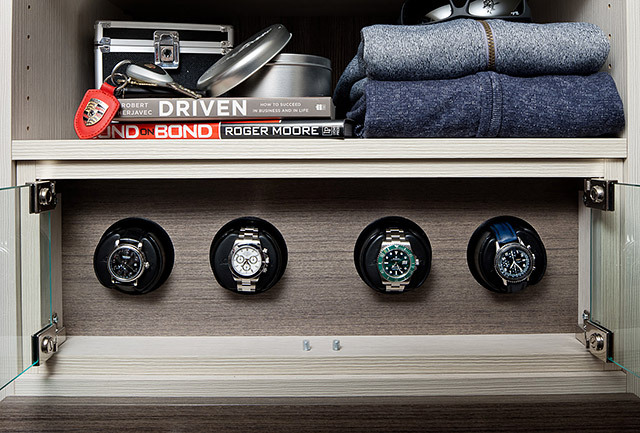 Using this handy closet accessory organizer will also keep your watches well-maintained. It will also make sure your watch collection stays organized and protected. Ask an Organized Interiors design consultant about the high quality Orbita watch winders we carry. They can be incorporated into your closet’s custom cabinetry design in a drawer or showcased more prominently in a beautiful glass case. A simple, yet incredibly useful closet accessory organizer solution are valet rods (also known as valet poles). Why are valet rods so useful in a bedroom closet space? Think about how many times you’ve hung a clothes hanger holding an outfit you’re wearing the next day or in a few hours on a door knob or from the top of an open door. That’s certainly not ideal. 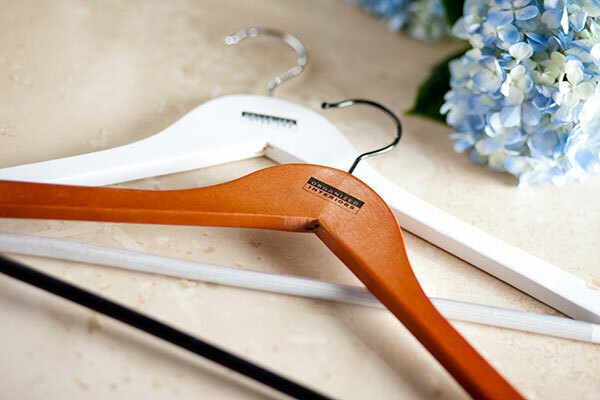 A retractable valet rod provides readily available hanging space so you can hang dry cleaning or the next day’s outfit properly, which can save you time in the morning. You’ll find the rod is surprisingly strong and conveniently stays out of the way when it isn’t needed with its telescopic design. Valet rods can also be used in any closet in your home and make a very practical addition to your laundry room. It goes without saying that keeping your footwear in disorganized piles in the closet is bad for a few reasons. First of all, it will be a daily chore trying to find matching pairs of dress shoes, heels, or boots. Having to rummage through a disorganized collection of footwear every morning will add up to hours of wasted time each year. Not taking care of your footwear also leads to them scuffing and scratching, which shortens your footwear’s life. Some delicate footwear and expensive designer shoes need especially careful care. 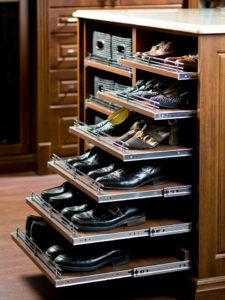 A pullout shoe rack is the perfect closet accessory organizer idea to address your shoe storage needs. Have your closet or dressing room’s shoe rack built to any depth of shelf so that shoes (as well as purses) can be stored more than one row deep. Using a pullout shoe rack allows you to see everything in your shoe collection at a glance and keeps all of your footwear well-organized and well-preserved.. Similar to the pullout tie rack is the handy sliding belt rack. Belts are another clothing accessory that often end up draped over a piece of furniture or door knob. Sometimes they’ll just get rolled up and stored on a shelf or the top of dresser. You can maintain the appearance of your belts and get a longer life from them by storing these accessories on a low profile sliding belt rack. These belt racks provide a dedicated home for your belt collection and make sure they maintain their shape. Another closet accessory organizer idea for your belts is to store them on a belt hook. Like the valet rod, a four position hanger is a practical closet accessory organizer that creates extra closet hanging space. This closet accessory may be tiny, but it’s stronger than it might look and very versatile. 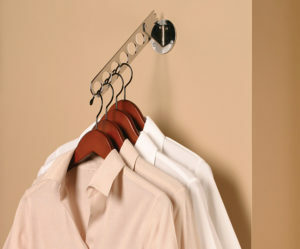 The hanger has holes for hanging multiple items of clothing, allowing you to get your outfits easily coordinated. The “four position” part of the name refers to the fact the hanger can be adjusted into four different positions, depending on your hanging needs. 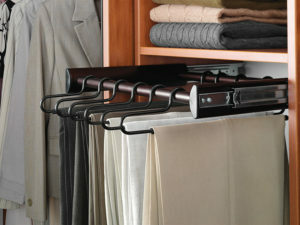 Four position hangers are another accessory that can be used in other places besides bedroom closets. They’re useful in a mudroom, laundry room, or can even be attached to the side of a cabinet or dresser. Fine jewellery should be kept in a proper home like a jewellery box or, even better, a jewellery drawer. 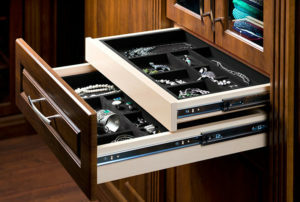 One more jewellery drawers can be added to your bedroom closet’s cabinetry to keep all of your earrings, bracelets, necklaces, rings, and other precious jewellery items organized. Keeping your jewellery collection hidden from view is also smart from a security perspective. 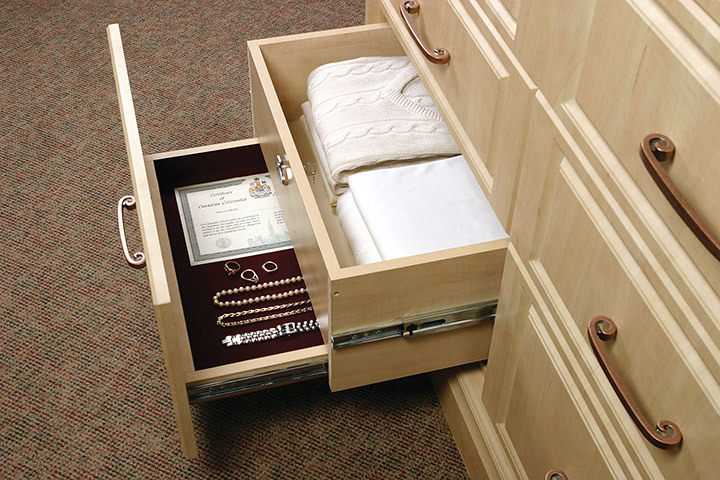 Our custom jewellery drawers feature velvet lining, which serves two purposes. First, it adds an elegant touch to where your valuables are kept. Secondly, the velvet lining (along with the drawer dividers) helps to keep your jewellery safe from scratches, scuffing, and tangling. This closet accessory organizer idea adds more functionality to your closet and can also allow you to maximize your closet’s storage space. A pullout pant rack accomplishes this by making better use of your bedroom closet’s underused lower storage space. A pant rack can be shorter or longer, depending on your available space and how many pairs of pants you need to hang. The rack easily pulls out when you need to choose a pair of pants and stays out of the way the rest of the time. Now you can keep all of your pants well-pressed, grouped together by colour, and more organized. Not every square inch of a closet interior needs to be filled with something being stored. Every closet should still include a few hooks, however, as a supplementary closet accessory organizer for any of your hangable items. 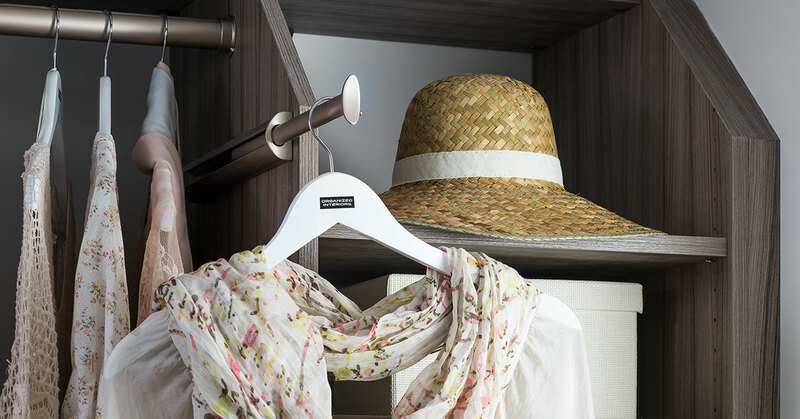 Hanging hats, purses, scarves, or any number of additional hangable items can free up space in your other closet storage systems. 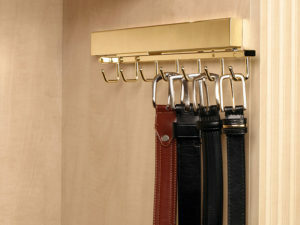 And because hooks are so small, they can be easily incorporated into your custom closet’s layout just about anywhere. 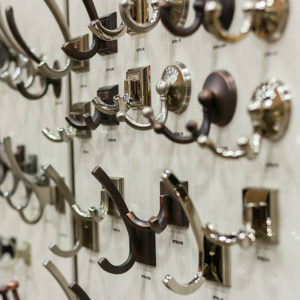 Visit our showroom to browse the hundreds of types of hooks and other decorative hardware items we have available. These are just a few of the clever bedroom closet accessory organizer products available at Organized Interiors. We also carry a wide variety of storage solutions for the entire home to save you time by helping your family to stay organized with less effort. Learn more about how our closet accessory organizer ideas and other products can simplify your life by booking a free in-home design consultation. Between waking up, eating breakfast, getting the kids fed and off to school, showering, getting dressed, and getting out the door in time to make it to work, your morning is pretty busy. By limiting the amount of time you spend looking for specific items, you can establish and maintain a good morning routine that’s efficient. Look no further than the closet for some ideas that can save you time in the morning. 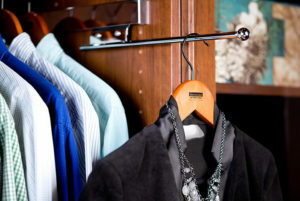 Having the right closet organizer and closet accessories will contribute to a good morning routine that’s stress-free. 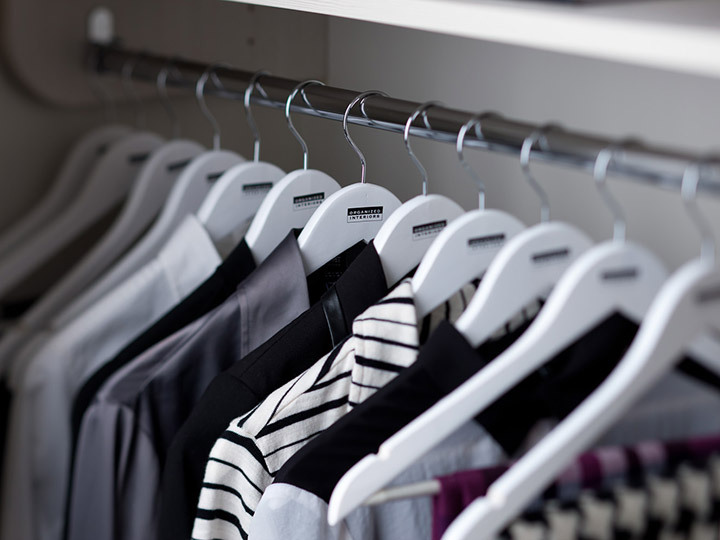 Let’s look at seven ways you can improve your closet space to save you time in the morning and throughout the day. Offering four positions in which to hang your items, this closet accessory is perfect for hanging the outfit you’ll be wearing the next day. A four position hanger barely takes up any space and is stronger than it looks. You might also consider adding a four position hanger to the side of a cabinet or to your laundry room or mudroom for additional hanging space. 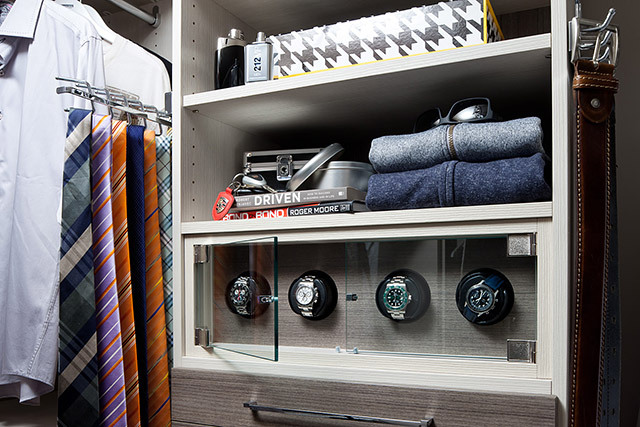 A retractable valet rod or two added to your closet is a simple, yet effective way to speed up your morning routine. Retractable valet rods take up very little space and can be used for hanging up the outfit you’ll be wearing the following day. Using a valet rod for your outfits will leave one less worry in the morning and your outfit will stay wrinkle-free, which might not be the case if you were draping the ready-to-wear ensemble over the back of a chair. Valet rods are also ideal for your laundry room. 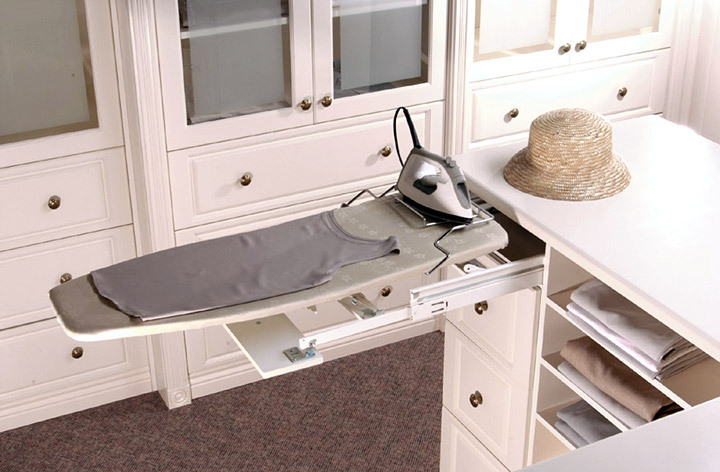 When you do need to give any of your clothing a quick ironing while getting ready in the morning, have a handy pullout ironing board added to a drawer in your closet, dressing room, or laundry room. It saves space and offers a quick, convenient solution when you’re pressed for time. Are your drawers containing your socks, underwear, and other small articles of clothing a complete mess? If so, that will slow you down whenever you’re searching for a particular item. Keep your drawers organized with helpful drawer dividers. You’ll find it much easier to sort and group your belongings and make sure you’re able to maintain a good morning routine. Hold all your belts in one place so you don’t waste your time searching for them in the morning. Attach a low profile sliding belt rack below a high closet shelf, which makes your belts easy to view and access. In addition to contributing to a good morning routine, this closet accessory also helps your belts maintain their shape. Earrings and other smaller jewellery items can be hard to keep track of without an effective organization system in place. 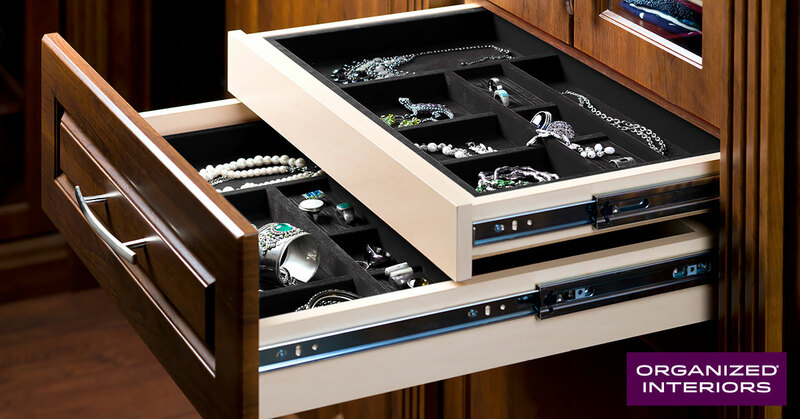 We can add one or more high quality jewellery drawers to your closet space to store your jewellery in compartments with a felt lining to protect your valuables. Saving the best for last, you’ll set yourself up for a successful morning routine by adding a custom closet organizer to your bedroom. Choose from our SmartLine, Classic, or Custom Cabinetry Collection organizers to significantly boost your ability to keep your closets tidy, thereby ensuring a good morning routine. Along with these seven ideas to improve your closet space, Organized Interiors has many more storage and organization solutions to help you maintain a good morning routine. From bedroom storage solutions like bed surrounds and wardrobes to custom cabinetry solutions for the rest of your home, we can help. If you’d like to improve the efficiency of your morning routine by adding better organization and storage to your home, book your complimentary in-home design consultation today. Collectors of high quality watches should have a watch winder and storage space, especially when their collection begins to grow. Among the smart closet accessories Organized Interiors carries is a custom watch winder and storage solution that’s perfect for any watch connoisseur. Whether your premium watch collection consists of a couple of timepieces or has grown to a number much larger, it’s wise to protect your investment. High quality watches have traditionally been passed down from one generation to the next. Having a custom watch winder and storage space that keeps them properly stored, organized, and wound will lengthen the life of your timepieces. Organized Interiors exclusively uses high quality Orbita watch winders in our custom watch storage designs for closets and dressing rooms. Orbita is an American company that was started in 1996 after founder Charles Agnoff was given a Rolex as a retirement gift. Although he loved the stylish look of the watch, he was frustrated that its otherwise brilliant design necessitated the time and date to be reset if the timepiece wasn’t worn for a few days. He applied his background in mechanical engineering to devise a winder that kept the watch wound and went on to find great success with his concept. Organized Interiors is firmly committed to using the highest quality products in our clients’ projects and Orbita watch winders certainly adhere to this philosophy. Orbita is considered the world’s leading manufacturer of watch winders and is renowned for its innovation and exceptional quality. Why is a watch winder worth having? If you’re unfamiliar with why a watch winder might be needed, here’s the reasoning. Automatic watches (also referred to as self-winding, mechanical, or some variation of all three terms) have a self-winding mechanism. The self-winding process only occurs when the watch is worn regularly, however. That’s because it’s activated by detecting regular wrist movement. If your luxury watch goes days or weeks without being worn, it stops running. The next time you wear the watch, the time and date will need to be updated. If you have a larger watch collection, this can be inconvenient because you’ll assuredly be changing your watches regularly to suit your mood or a specific wardrobe choice. A watch winder simply keeps the watch always running, thereby keeping the time and date accurate, in addition to keeping it well-maintained. Orbita’s unique Rotorwind technology is a great example of their innovative design approach. Unlike traditional watch winders, the Rotorwind system actually replicates the motion of the wrist, which activates the self-winding mechanism. Using a tiny amount of lithium battery power, the winding system activates every few minutes to keep the watch running. Orbita also sells traditional rotating-style watch winders that can be programmed, depending on the individual needs of your watches. Our custom watch winder and storage space designs will do more than just provide an area to keep your treasured timepieces stored, protected, and well-organized. We can design a closet, dressing room, or bedroom space for your watches that will enhance their natural beauty. 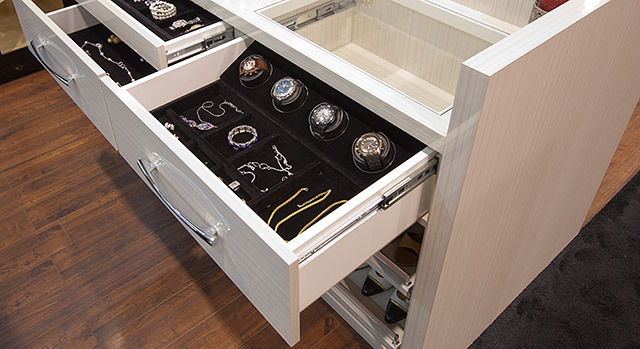 Your watch winder and storage space can be added to an elegant custom drawer with felt lining. For a more visible storage space, we can design a beautiful glass case that shows off your prized watch collection. Regardless of the size of your collection of fine watches, we can accommodate your needs. You can learn more about our elegant watch winder and storage space solutions and other helpful closet accessories by visiting our 10,000 square foot showroom. With Mother’s Day and Father’s Day just around the corner, why not consider this stylish and functional gift idea for the watch connoisseur in your life? Schedule your free in-home design consultation today and you’ll be able to make that happen.